Our collaboration with Boston based yogaHOPE came about because of a close alignment of their work and their mission with OMID’s mission and vision; also because this program provides the opportunity to not only deliver a program that addresses the impact of trauma on mind and body, but leads to a training program that also enables young women who participate in the program and are then able to lead it at OMID and in their communities. yogaHOPE’s focus is on the implementation of its Trauma Informed Mind Body (TIMBo) program. TIMBo offers a deliverable, research-based curriculum addressing the ways in which mind-body practices allow for long-term resilience through emotional regulation and a reduction of stress, chronic stress and traumatic stress. TIMBo offers individuals the tools needed to address the social, emotional, and physiological root causes of myriad mental health issues, and enables them to heal and to improve emotional regulation for themselves and their children and families. The program is evidence-based, trauma-informed, and gender-responsive, utilizing the strengths that already are present in women, and leaves participants with tools to address their habituated patterns and symptoms that lead to relapse and entrapment in the cycle of stress and trauma. It is also simple, accessible, measurable and scalable and at the cutting edge of mental and behavioral health intervention. The fundamental components of trauma-informed programming are safety, awareness, and acceptance. The TIMBo program comprises sixteen one and a half hour sessions, whose goal is to increase capacity for awareness of both internal and external states (mindfulness). Before starting our work at OMID in Tehran we had to train Persian speaking TIMBo lead facilitators at yogaHOPE in Boston. With TIMBo at OMID there have been three different phases completed to date, covering planning and preparation which ran from March 2015 until January 2016; program delivery, research and implementation, which happened in February and March this year and facilitator training at OMID, which just started in April and runs through to September 2016. With TIMBo at OMID there are three different phases: Firstly, overall project planning, research and preparation which ran from March 2015 until January 2016; Then program delivery, research and implementation, which commenced in February and March 2016 and the third stage covering facilitation training, for which planning and preparation has started. The Implementation of this third stage is still under way. Participants will be trained through a fourteen day program of sessions, between now and July, lasting six hours each. A facilitator’s manual and its adaption to OMID will also be produced at the end of this phase. Delivery of the training plan is due to be completed by September and will also comprise fourteen days of training for all twenty six participants, who went through the therapeutic stages program to learn how to become a good facilitator, so making the program sustainable and providing a future career development pathway for the OMID girls who choose to become trainers. Ongoing training and TIMBo groups at OMID will run from November 2016 until March 2017, where the trained facilitators along with the mentorship of TIMBO certified trainers will begin running TIMBO groups at OMID and in the community. It is also anticipated that there will be 10 lead facilitators, 10 co-facilitators and possibly 6 participants who will need further training and development to reach facilitation phase. 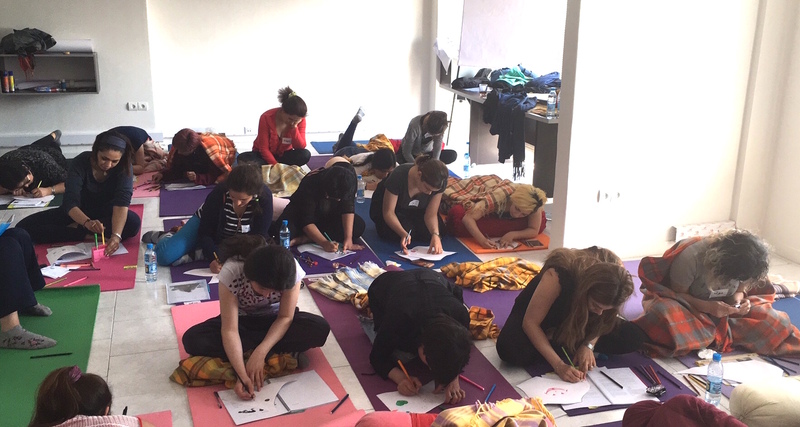 TIMBo lead trainers will plan on returning to OMID to oversee and mentor the implementation of the groups and to provide supplemental trainings for the lead facilitators. Although this work is still in progress, we have had several accomplishments to date. One is that we were able to translate, edit and format the TIMBo manual into Persian. This makes the program accessible not only to the target audience covered by this proposal but also to all other Persian speaking women all over the world. These are accomplishments that OMID and yogaHOPE are very excited about. 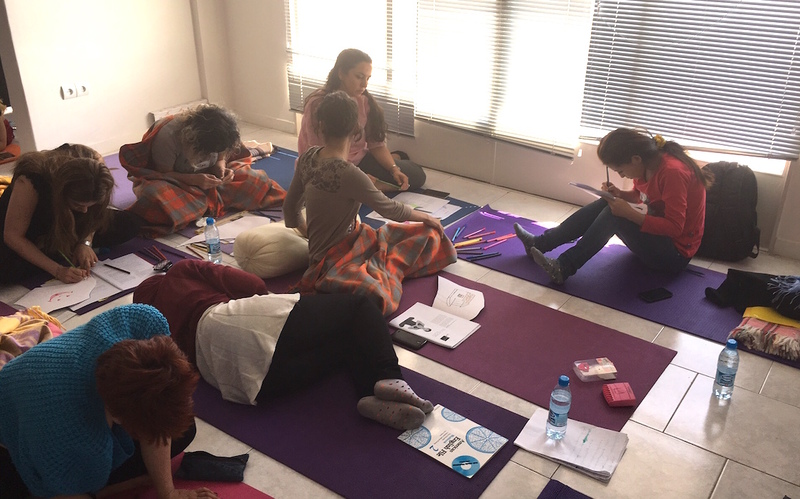 “Since the group ended, my friends and I try to use the breathing techniques to calm our bodies or bring more awareness to our day to day activities and feelings, I can’t wait to participate in the second phase and teach this to other girls”.